Meade Sparks made drinks on Halloween at Allston’s White Horse Tavern, which will be open for an extra hour Sunday morning. The coming end of daylight saving time means the sun will set long before 5 p.m., sending many more people home from work in the dark each evening. One other odd thing that happens when the clocks are turned back: Bars can stay open an additional 60 minutes one night each year. Daylight saving time will officially end at 2 a.m. Sunday, setting the clock back an hour. That means closing time at many Boston bars — legally, 2 a.m. — will also be pushed back that night. “Bars and restaurants with licenses are able to stay open until their official closing time,” said spokeswoman Chandra Allard of the Massachusetts Alcoholic Beverages Control Commission. So this Saturday night, they have the option to remain open the extra hour. “It’s up to the discretion of the bar owner,” she said. Doug Bacon plans to take advantage of the changing clocks this weekend. He’ll keep the doors open an extra hour for the first time at his establishments, the White Horse Tavern, The Avenue Bar & Grille, and Shanghai Social Club in Allston, The Last Drop and Harry’s Bar & Grill in Brighton, and The Corner Tavern in the Back Bay. “I expect to see some extra business, I think the novelty is something that people will be attracted to, and I think it may, over a period of a few years, grow into something where we promote an extra hour Saturday that only comes once a year,” Bacon said. Bacon said that in previous years he had been unclear about the legality of serving past the traditional hour. And while the novelty could attract more customers, it might not mean more dollars. “It’s something that we’re planning to do and we’re going to let our customers know, but I don’t know if it’s going to make a big impact,” Bacon said. John Drew, bar manager at Blue Dragon near the South Boston Waterfront, said an extra hour won’t necessarily translate into more tips for servers. Blue Dragon closes at 1 a.m. and will not be affected by the time change. Drew said he expects little good to come from longer bar service. David DeIuliis, a spokesman for Mothers Against Drunk Driving Massachusetts, said he sees nothing wrong with serving for an extra hour once a year but also cautioned bar staff to be more careful with who they let in and serve. “I think the owners of licensed establishments need to be more vigilant, not overserving, not serving minors, but as long as they’re not doing those things we don’t have an issue with it,” DeIuliis said. 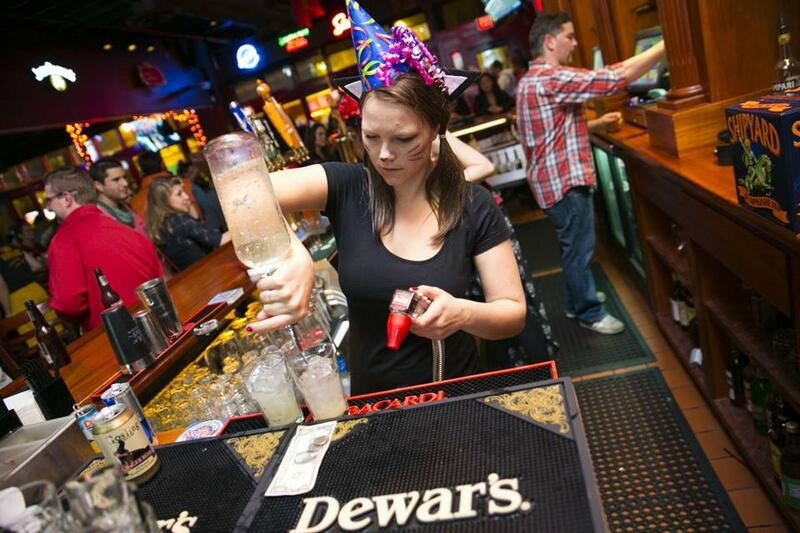 Bacon said his bar managers are careful not to overserve, and does not foresee a problem with the extra hour. While Bacon may be keeping his doors open for the extra hour, many other hot spots will not extend last call this weekend. When asked about their plans, managers at Tavern in the Square in Allston and Phoenix Landing in Cambridge said they had believed they were not legally allowed to remain open. Emily Overholt can be reached at emily.overholt@globe.com. To find her on Twitter follow @emilyoverholt.